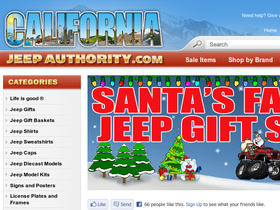 Shop California Jeep Authority online at CaliforniaJeepAuthority.com for everything having to do with loving Jeeps. California Jeep Authority carries Jeep Shirts, Jeep Caps, Jeep Gifts, Jeep Gift Baskets, Jeep Sweatshirts, Jeep Diecast Models, Jeep Model Kits, Jeep Blankets, Jeep Dog Toys, Jeep Signs, Jeep Knives, Jeep Calendars, Jeep Keyrings, Jeep Toys and Puzzles, Jeep Decals, Jeep Accessories, Jeep Glassware, Offroad Tools, Jeep Camping Gear and It's A Jeep Thing...items. Save on your next purchase from CaliforniaJeepAuthority.com with California Jeep Authority discounts, California Jeep Authority coupons, California Jeep Authority promotions and California Jeep Authority savings from 58coupons.com. Save $10 on your order of $100 or more from CaliforniaJeepAuthority.com with this coupon code. Enjoy Free Shipping from California Jeep Authority on orders of $100 or more. Click link to view. Shop the Sale Section at California Jeep Authority to save up to 30% or more on all things Jeep. Click link to view. Get on over to CaliforniaJeepAuthority.com to pick up one or more of these cool Jeep signs.